Less than 24 hours after the Abbas-Trump meeting in Bethlehem, in which Abbas promised Trump and his representative, Jason Greenblatt, to cease all forms of incitement against Israel, the Palestinian Authority (PA) government in Ramallah resumed its vicious rhetorical attacks on Israel. The Palestinian denial of Jewish ties and history to the land also continues full blast, despite Abbas's pledge to Trump that Palestinians are not in conflict with Jews or Judaism. 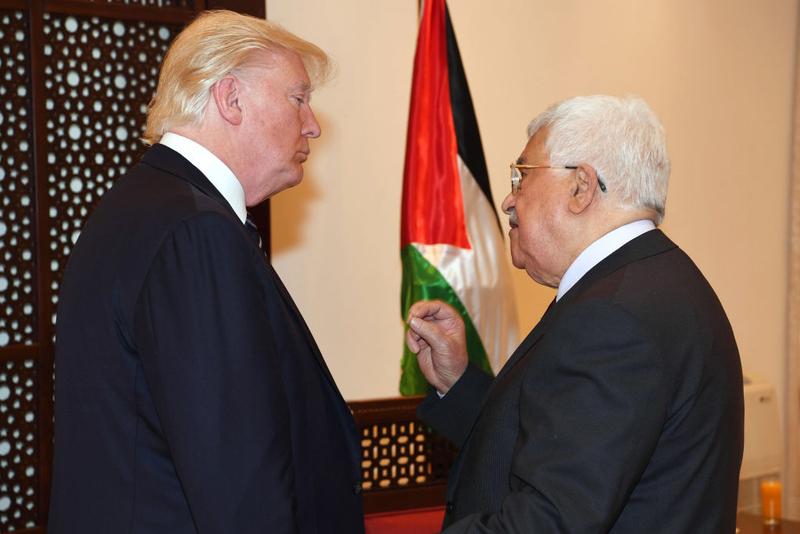 Hard on the heels of Palestinian Authority (PA) President Mahmoud Abbas's assurances to US President Donald Trump that he is raising Palestinians on a "culture of peace," he continues to glorify terrorists who have Jewish blood on their hands. Abbas, who met with Trump in Bethlehem on May 23, told reporters that he was committed to working with the new US administration to achieve a "historic peace deal with Israel." Abbas also announced his readiness to become a "partner in the war on terrorism in our region and the world." He claimed that he and his Palestinian Authority have been promoting "tolerance and coexistence, and spreading a culture of peace and renouncing violence." Abbas's sweet talk, however, did not last long. Just hours after Trump left the region, Abbas and his PA returned to their anti-Israel incitement. This stands in blinding contrast to what Abbas told Trump and his Middle East envoy, Jason Greenblatt, with whom Abbas met 48 hours after his get-together with Trump in Bethlehem. At a meeting of Fatah leaders in Ramallah on May 25, Abbas described Palestinian prisoners held by Israel as "heroes." His remarks came in response to the hunger strike of more than 1,000 Palestinian prisoners, many of whom are serving lengthy terms for murdering or wounding hundreds of Israelis. The hunger strike, which began on April 17, is led by Marwan Barghouti, a senior official with Abbas's Fatah faction who is serving five life terms in prison for his role in a spate of terror attacks that killed five Israelis during the Second Intifada (2000-2005). Referring to the convicted terrorists as "our heroes," Abbas lashed out at the Israeli government for its refusal to surrender to the demands of the hunger strikers. "We will stand with them and support them," Abbas said, referring to the convicted terrorists. 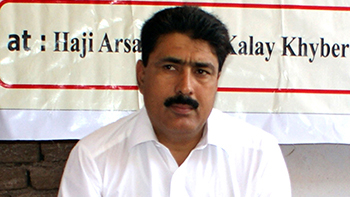 "We will emerge triumphant and we won't allow [Israel] to defeat or humiliate the prisoners." Abbas's powerful message flies in the face of his promise to Trump and his representative, Jason Greenblatt, to cease all forms of incitement against Israel. By describing the convicted terrorists as "heroes," Abbas is in fact sending a message to all Palestinians that murdering Jews is a noble and heroic act. Such rhetoric prompts Palestinians to launch terror attacks against Israelis. It is a clear call by Abbas for Palestinians to follow in the footsteps of terrorists and murderers. Is this Abbas's way of promoting a "culture of peace" among his people? Is this his version of encouraging Palestinians to renounce violence? Less than 24 hours after the Abbas-Trump meeting in Bethlehem, in which he promised Trump and envoy Jason Greenblatt to cease all forms of incitement against Israel, the PA government in Ramallah resumed its vicious rhetorical attacks on Israel. The attacks came in response to celebrations marking the 50th anniversary of the liberation and unification of Jerusalem. They also came in response to routine and peaceful visits by Jews to the Temple Mount in Jerusalem. In a statement issued by the Palestinian Authority on May 24 that is reminiscent of a medieval blood libel against Jews, Israel was accused of perpetrating "black crimes" against Jerusalem and Palestinians and of defiling Islamic holy sites in the city. It described the Jews visiting the Temple Mount as "extremist settlers" and falsely claimed that they were deliberately targeting the Al-Aqsa Mosque (on the Temple Mount). In fact, Jewish visitors never enter the mosque. It is precisely this kind of rhetoric that drives Palestinians to launch knife and car-ramming attacks against Israelis. For the past year and a half, Abbas and his PA officials and institutions have been waging a poisonous campaign of incitement surrounding peaceful, permitted Jewish visits to the Temple Mount. The incitement has resulted in a wave of terror attacks against Israelis. How does this fit in with promoting peace? Abbas's prime minister, Rami Hamdallah, both before and after the meeting with Trump, has also joined the chorus of glorifying convicted terrorists. In a statement on May 25, Hamdallah, who is often referred to by Westerners as a moderate and pragmatist, stated: "We salute the legendary steadfastness displayed by the knights of freedom, our heroic prisoners." Like his boss, Abbas, Hamdallah also strongly condemned the Israeli government for failing to comply with the hunger strikers' demands, which include increased family visitations, allowing inmates to have a photograph with their families every three months, installing more TV channels and air conditioning in their cells, and increased access to university studies. Hamdallah and Abbas are sending precisely the same message to the Palestinians: if you murder a Jew, you earn the title of "knight of freedom." In other words, Hamdallah, too, is urging Palestinians to engage in acts of violence against Israelis. One wonders exactly how Abbas and his officials will explain these statements to Trump and the U.S. Administration. Experience has shown that the glorification of terrorism and jihad (holy war) only serves to encourage more Palestinians to take to the streets and stab or run over with their cars the first Jew they see. Hours after Trump left the region, Abbas's spokesman, Nabil Abu Rudaineh, issued a statement that pointedly ignored any Jewish links to the land. "East Jerusalem, with its Islamic and Christian holy sites, will remain the eternal capital of the State of Palestine," Abu Rudaineh announced. Note his deliberate omission of any reference to Jewish holy sites in the city. This is neither a slip of the tongue nor a poorly-worded statement on the part of Abbas's spokesman. Rather, it is an intentional denial of Jewish rights to Jerusalem, including the Western Wall, which Palestinians refer to as an integral part of the Al-Aqsa Mosque and claim has no significance to Jews. This has always been part of the Palestinian strategy -- to deny Jewish rights and to delegitimize Israel. Like his boss, Abbas, however, Abu Rudaineh seems to have a good sense of humor. He has called on Israeli Prime Minister Binyamin Netanyahu to "stop his daily incitement against Palestinians and their leaders." And what is the content of Netanyahu's "incitement"? His statement that a united Jerusalem will remain the undivided capital of Israel. In the view of Abbas's spokesperson, such a statement is clear "incitement" -- not the glorification of terrorists, not the incendiary anti-Israel rhetoric and not the continued denial of Jewish history and rights. President Trump's visit to Israel proved to be yet another opportunity for Abbas and his Palestinian Authority to practice once again their skills of deceit and deception. In English, everything sounds great. In Arabic, however, the messages sent by Abbas to his people take on the unmistakable ring of hate. Why is anybody surprised that a terrorist and pathological Muslim liar, Abbas, continues riling up Muslim mobs against Israel. As all Muslim tyrants, Abbas needs an external enemy to cover up his stealing money from his people and their misery as they are ruled by the totalitarian, supremacist, apartheid and imperialistic IDEOLOGY of Islam, which is worse than Nazism. All Muslims from West Bank should be transferred to Jordan and other Muslims occupied countries from where Jews were ethnically cleansed in and around 1948...Muslims from Gaza should be transferred to Egypt and become citizens of this large Muslim country as they were before 1967 war. There is one good reason why Abu Mazen says one thing to Trump and another to Palestinians and fellow Arabs...survival. If his allies and adversaries are not 100% convinced that he will never compromise their goal of replacing the State of Israel with the State of Palestine, Jews with Muslims, they will kill him and brand him a traitor. If Trump doesn't understand that yet, he soon will. The only kind of peace that Abu Mazen can agree to is one in which the Palestinians believe that they will eventually take over. And that kind of peace is nothing but perpetual war. Who said that ANYONE was surprised by Abbas' lying? Trump traveled, met, and presented his POV. Anybody who believed that Trump would come home waving a peace treaty is the one who is "misinformed". Outraged, as someone suggested? Obama is the one who always expressed his outrage. Trump is another kind of president. I never cared much what Obama's mood was but if Trump suddenly announced that he was "outraged" I'd be afraid and so should Abbas. There is nothing new here. They are the Devil's children and the Palestinians speak the language of the Father of Lies. Trump is not ignorant of this nonsense diplomacy. He has to make a show so that the news will suggest he is trying the Globalist approach, and Abbas has to do his part in order to determine if Trump is an idiot on foreign affairs like all the Presidents since Jimmy Carter and thst includes our dearly departed Ronald. Now that the shakeout has occured, Trump can get down to cut-throat! Trump should tell Abbas, for every lie you tell me, you lose 10 acres of land. For every threat of violence you make, you lose 10 acres of land. If you run out of land, which Palestinians have never owned anyway, you will be removed from the area. If you don't like or accept these terms, I strongly suggest you deal honestly and earnestly with Israel. The USA will stand firmly with Israel. I think Trump realizes that Abbas is a lying snake but wanted to give him a chance to change his ways, which is why they met. Nothing will ever change with this unless the US and Israel become resolved to take a hard line and dish it right back at the PLO. There is no doubt that Mr Trump knows what is going on, the US government and secret services are not stupid. They monitor all communications. Mr Trump is being diplomatic, and allowing them to change, knowing that they are under his radar. That is the fair thing to do. He will not allow them to go far with the deceptions. Surely it should be obvious by now that the Palestinians are not interested in peace. They are only interested in the destruction of Israel. Let them wallow in their self imposed hate and ignorance. Just make sure there is a secure fence around their wallow. Abbas is a known quantity, and behaving as one would expect him to. The question is whether Trump now understands (if he didn't before) that the Palestinian leadership are liars and terrorists, and that nothing regarding peace can be negotiated with them -- that they aren't interested in co-existing with Israel. Trump, unless he's being ill-informed and ill-advised by Mattis and McMaster, ought to have had Abbas's number before meeting him. So he shouldn't be outraged that Abbas lied to him. You don't deal with thugs and killers like Abbas. You don't sit down to have cozy discussions with the likes of Abbas. You don't even let him into the White House. Nothing new here. Exact same thing that we saw with Arafat. Say one thing in English ("Let's make peace!") to the rest of the world, then the exact opposite in Arabic ("Kill, kill, kill!") to his followers when he goes home. If Trump is half as canny as he appears to be he will have known. But making a big fuss is his way of highlighting Abbas lies on the international stage. @GK: you've succinctly stated the penultimate truth. I am a member of several organizations and one of them, MEMRI, reports on what the Arab leaders say IN ARABIC TO THEIR OWN PEOPLE. That is what counts..not what they say in English to us. My continued criticisms of Israel are their leniency, in my view, in their treatment of Palestinian prisoners and their past restraint in the wars in Gaza along with their gross inadequacy in their hasbara-public relations in terms of setting forth the overwhelming guilt of the Arabs. The latter always has amazed me as a retired marketing/advertising businessman because of the surfeit of very able p.r./advertising/mktg people in both America and Israel who are Zionists. If Trump wants peace to succeed, he will have to lead from a position of strength, rather than the weakness the last 4 presidents have shown resulting in failure. E.g. No concessions to Arabs (so-called Palestinians) until the electric bill is paid in full, rocket attacks on Israel, knife and vehicle attacks, and verbal incitement have ceased for at least 1 yr., failing which all Palestinian-designated lands under the Oslo Accords will be returned to Israeli control. Jerusalem is off the table. The U.S. embassy will be moved to Jerusalem, and any ensuing violence will be met by the U.S. army being deployed to Israel to work with, and under the authority of, the IDF to fight such terrorism. Backt up all these conditions with action. Also, all teaching of children via tv and schools to hate and kill Jews must also cease for at least 1 yr. Monitor their tv shows and schools and shut down tv stations and schools that don't comply. Time to get tough. Trump should counter Abbas's comments with an announcement. The United States is moving its embassy to Jerusalem. The only real surprise here is that anyone is surprised by Abbas lying. Both he and his mentor, Yasser Arafat, have long histories of saying what the West wants to hear in English, then exposing their true beliefs to the Arabic media. Unfortunately for the West, the last Western diplomat who understood the Arab mentality was Thomas Jefferson and the last US president who understood them was James Madison. Their understanding of that mentality is why the US fought two wars against the Barbary pirates in the early 19th century. Well, let's welcome Mr Trump to the truth about the fake so-called Palestinians. That is that everything about them, their claims, their narrative, their demands, promises and agreements are lies, lies and more lies. Abbas, it appears, thinks that Trump is an idiot. If Trump puts any trust in this man and believes anything this man says, at all, normally at the expense of Israel, I may for once agree with Abbas. Just the usual support of Islamic terror against the Jewish state of Israel. Who could have possibly hoped for something else? So, once again, WHAT ELSE IS NEW??? It is time for Abbas to retire --- far away from Israel, Period!!! The whole world knows that Jerusalem is A JEWISH CITY, PERIOD!!! The problem is, as usual, ANTISEMITISM, PERIOD!!! Get used to it --- THERE IS NO GETTING RID OF THE JEWS, PERIOD!!! Thank you Bassam Tawill and Gatestone.